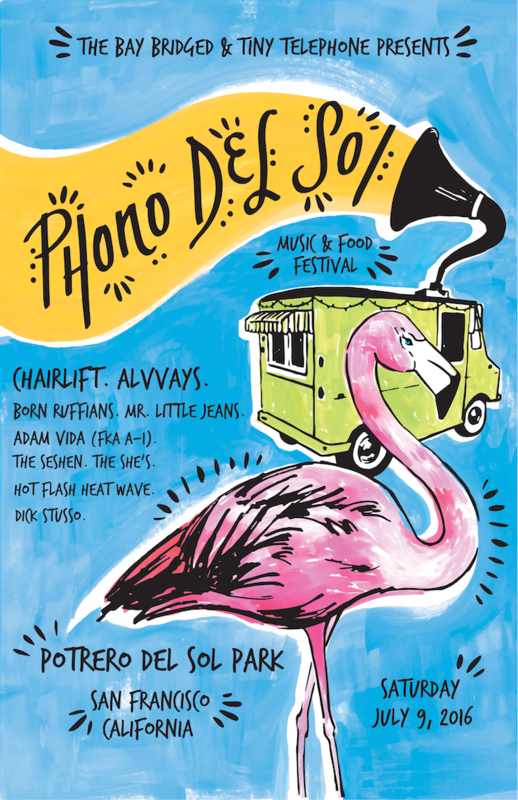 Phono del Sol Music & Food Festival is back for its sixth year of music and munchies. The day-long festival is scheduled for July 9th, 2016 and will pack in sets by nine bands, including Born Ruffians, Chairlift, and SF-based groups like The She’s and Hot Flash Heat Wave. While the players jam away, ten of the Bay Area’s finest food trucks will be whipping up delicious snacks to keep the crowds well fed. Festival-goers will get to browse the offerings of Mozzeria, Curry Up Now, and Bacon Bacon, among others, before heading over to the stages to catch their favorite bands. The annual nonprofit event is produced by The Bay Bridged with the support of Tiny Telephone and DotheBay and is put on entirely by volunteers — a serious labor of love that results in a stellar day of beats, booze, snacks, and sun. As the feel-good cherry on top of this funky sundae, part of the proceeds from ticket sales go to supporting SF’s Parks and Recreation department so park-lovers can keep on enjoying our city’s green spaces. The festival first premiered in 2010 as The Bay Bridged’s flagship event. The first event only featured five bands and five food trucks, but local music and food-lovers still packed beautiful Potrero del Sol Park to the brim. This year, local and international bands will take over two stages, while families and friends can walk among the row of food trucks and art vendors, lounge in the beer and cocktail gardens, and dance their faces off. The festival doors located at 25th and Utah Streets will open at noon on July 9th and music-lovers of all ages are welcome, though IDs will be checked before any booze can be bought. Kids 5 years and under can get in for free, while adults can buy tickets online or at the door until they sell out.